A One Advertising Sdn Bhd is a signage supplier company. 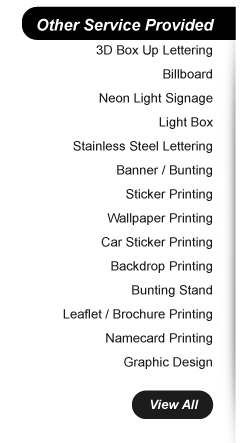 Besides that, we also provide printing services. Our company is located in Klang, Selangor, Malaysia. Our products include LED conceal box up, LED backlit box up, full color LED panel, EG box up, acrylic box up, acrylic poster frame, aluminium composite panel with LED box up, lightbox, billboard, zig-zag banner sign, project billboard, vehicle car sticker, etc.